At Novotel, technology and innovation strengthen bonds between people and simplify hotel stays for guests. 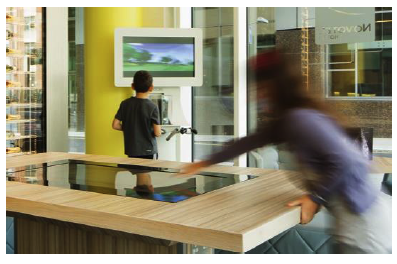 The latest example of this positioning is PLAY, a multimedia table developed in partnership with Microsoft, Humelab and After-Mouse. Equipped with the top hits games such as Angry Birds, it allows customers to enjoy solo, with their friends or family. Novotel incorporates the latest uses of new technologies to offer its customers an environment that resembles them. All features and deployed services are designed to improve speed, accessibility and mobility. 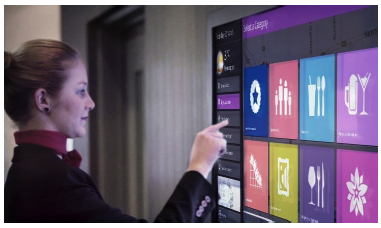 The latest innovative service offered by Novotel is PLAY, the multimedia table developed in partnership with Microsoft, Humelab and After-Mouse. It will be available from end June 2014 in 12 pilot lobbies around the world, including in Milan, Brussels, London, Paris, Sydney, Casablanca, Dubai and Rio. This little technological gem offers a wide range of entertainment and the brand intends to roll it out a rapid pace across the entire Novotel network by 2015. 40% of Novotel’s guests are leisure travelers. The brand decided to offer XBOX 360 game consoles in dedicated public areas which are open to all its guests. This service is currently available in 325 hotels around the world. Novotel also offers complimentary Kinect in 155 hotels so guests can browse and play games. Very high quality Wi-Fi connection is vital so that guests can browse the internet at any time, stay in touch with their community or share their leisure activities. Wi-Fi has become a determining factor when choosing a hotel. Novotel has accounted for this requirement perfectly and offers free Wi-Fi in all its hotels. 100% of the brand’s French network, or 110 hotels, and 85% of its international network offers this service. The aim is to equip the entire world network by 2015. Already over 300,000 digital postcards sent every month through the Virtual Concierge! To take its guests’ digital experience that extra mile, Novotel’s virtual concierge is also available as a smartphone app (Novotel Virtual Concierge Mobile App) for Android and IOS devices. Guests with a taste for independence will therefore be able to use this app to tailor make their stays. A year after its launch, the Virtual Concierge is now available in more than 250 Novotel establishments around the world. It is a huge success and is used by guests to find activities near the hotel (36%), to calculate itineraries (20%), or consult the weather forecast (17%). Novotel offers a fully-fledged technological ecosystem designed to enrich the guest experience and make it unique. Since its launch in 1967, Novotel brand has always been tuned into emerging trends (TV set and bathroom in every room) and will undoubtedly be offering more innovations soon to make every stay unforgettable.